Dinosaurs’ faces might have been much more sensitive than previously thought, according to a University of Southampton study – helping them with everything from picking flesh from bones to wooing potential mates. 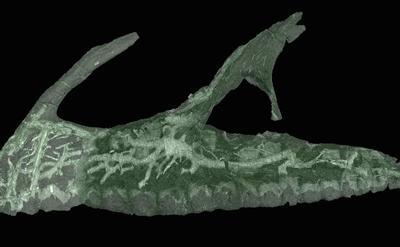 Experts used advanced X-ray and 3D imaging techniques at the University’s μ-VIS X-Ray Imaging Centre to look inside the fossilised skull of Neovenator salerii – a large carnivorous land-based dinosaur found on the Isle of Wight, and currently housed in the Dinosaur Isle museum – and found evidence that it possessed an extremely sensitive snout of a kind previously only associated with aquatic feeders. The blood vessels and nerves that supply the head are poorly documented in dinosaur fossils, but the new study published in online journal Scientific Reports shows that Neovenator may have possessed pressure receptors in the skin of its snout – similar to those which allow crocodiles to forage in murky water. However, nothing about the 125-million-year-old dinosaur suggests it was an aquatic feeder, so researchers believe it must have developed such a sensitive snout for other purposes. University of Southampton graduate Chris Barker, who was studying for his Masters degree in Vertebrate Palaeontology when he carried out the research, said: “The 3D picture we built up of the inside of Neovenator’s skull was more detailed than any of us could have hoped for, revealing the most complete dinosaur neurovascular canal that we know of. As well as being sensitive to touch, Neovenator might also have been able to receive information relating to stimuli such as pressure and temperature, which would have come in useful for many activities – from stroking each other’s faces during courtship rituals to precision feeding. Images of the wear pattern on the dinosaur’s teeth appear to show that it actively avoided bone while removing flesh from bones. Chris added: “Some modern-day species, such as crocodilians and megapode birds, use their snout to measure nest temperature, and in the case of crocodiles even pick up their young with extreme care, despite their huge mouths. Neovenator might well have done the same. Elis Newham, a University of Southampton PhD researcher who was also involved in the study, commented: “This finding comes at an exciting time in palaeontology, where we are using state-of-the-art technology to shed new light on the physiologies of extinct animals.